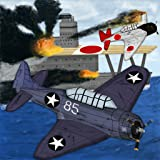 Fight through 16 historical missions of the Pacific War. Enjoy a variety of operations, including fleet to fleet combat, landing and defence battles or sole aircraft dogfights for intense fun. Witness powerful battles with over 300 objects fighting at the same time!